SCANPAN is famous around the globe for our unique non-stick coating. And the continuous development of our coating is at the core of our product development. 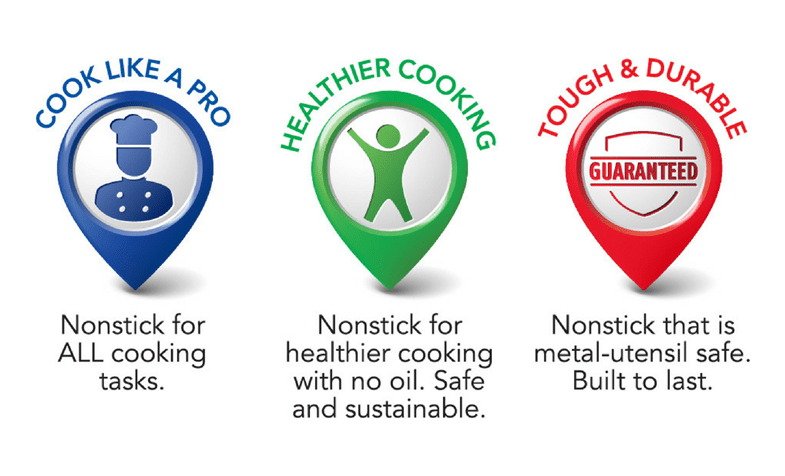 With the introduction of our new coating called Stratanium, we have taken a huge leap in our journey in the world of non-stick technology development. PERFORMANCE: Nonstick that sears, braises and deglazes. HEALTHIER COOKING: Nonstick for healthier cooking with no oil. Safe and sustainable. DURABILITY: Nonstick that is dishwasher and metal-utensil safe. Built to last. 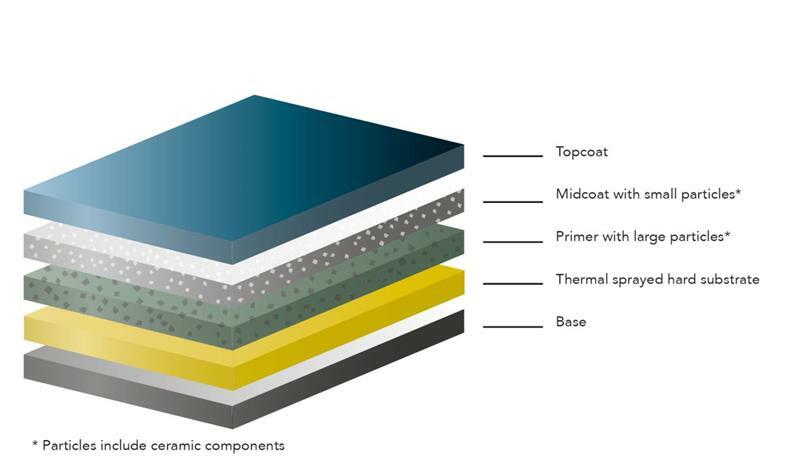 With the introduction of the new Stratanium coating, SCANPAN is once again breaking the boundaries of what a non-stick surface can do. The company has managed to develop a surface coating that combines non-stick properties, durability and unique frying properties. For example, with Stratanium you no longer need to use fat for frying, not even to achieve the right frying crust. This means that Stratanium not only contributes to a healthier lifestyle, it also allows you to fry your dishes like a professional. The frying properties are excellent, and your meat will be perfectly browned. You can fry food without the need for fats, which means healthier meals. Both strength and food release are improved by at least 30%, when compared to the best non-stick coatings on the market to date. With Stratanium, you no longer need to worry about which utensils you use; the solid coating will support the use of metal tools. And cleaning has never been simpler. Throughout SCANPAN’s 60-year history, the company’s core focus has been on making our Danish-produced frying pans and saucepans stand out in the market. 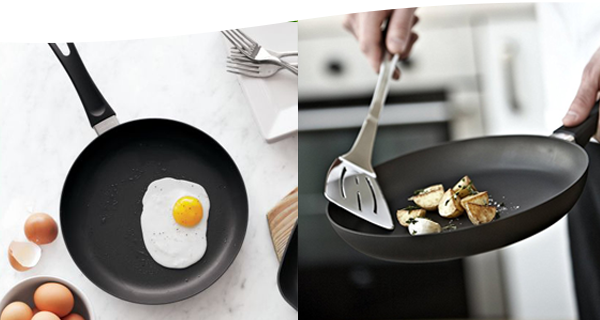 We use numerous resources to develop our unique craftsmanship, where each individual frying pan is hand-cast in recycled aluminium using high-tech patented technologies, making SCANPAN’s non-stick coating famous all around the world. We have made great strides over the years, setting new standards for sustainable production, the use of recycled aluminium and in non-stick surfaces. That’s why SCANPAN is the preferred supplier for a number of well-known chefs all over the world. 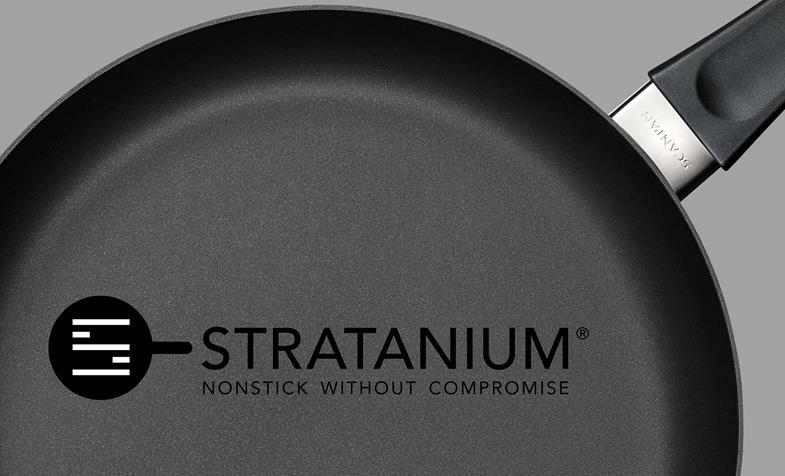 Our new non-stick coating, Stratanium, is the latest result of SCANPAN’s constant search for improvement and new technology to make the impossible possible: to increase durability and food release by more than 30%. Stratanium´s main features include multiple layers of non-stick coating, including small and large, hard particles that interlock with thermally sprayed layers to reinforce the non-stick coating. Layering this way makes it possible to increase the total thickness and get 30% better non-stick effect; 30% increased toughness and durability; while also improving the non-stick abrasion, and overall lifetime by 30%. The result of this unique layering combination offers an outstanding cooking performance.